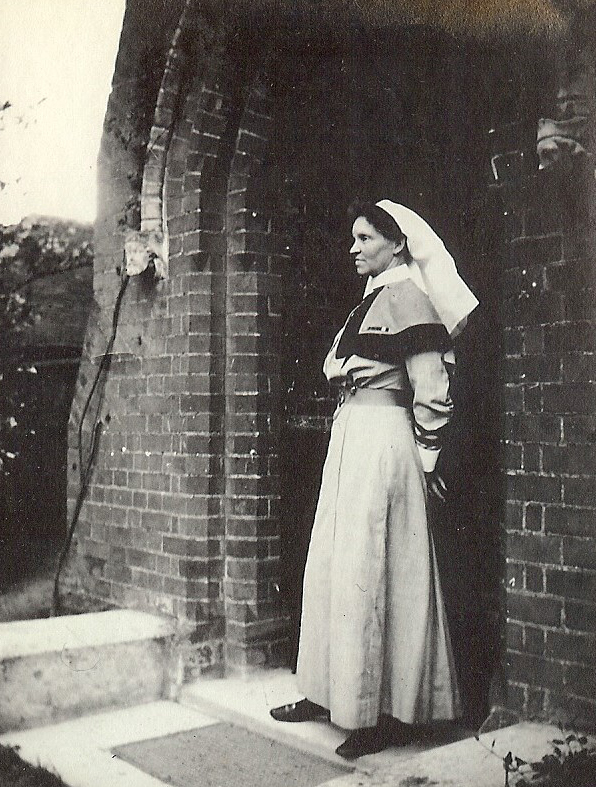 One of the stories we have been following over the course of the First World War centenary commemorations is that of Sister Kate Luard (read all of our Kate Luard posts here). Kate was born in Aveley in 1872 and grew up in Birch near Colchester. On the outbreak of the war she volunteered to nurse on the Western Front, and remained there for the duration of the war. 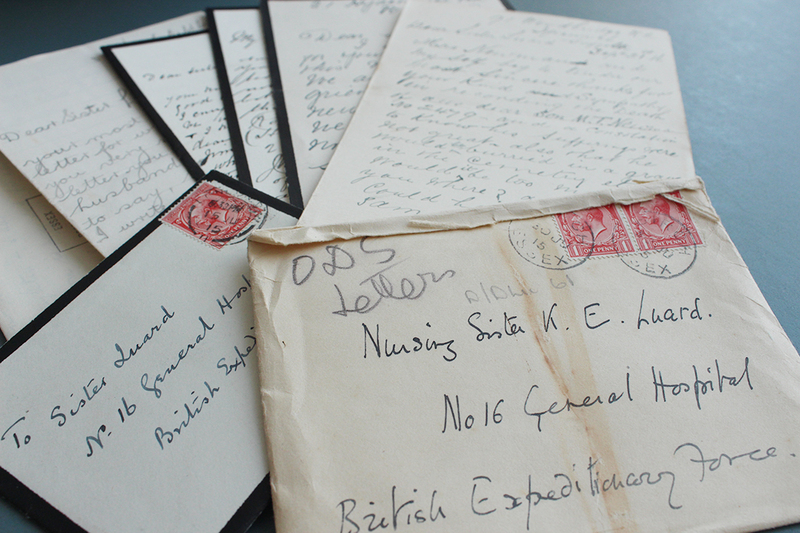 During this time she wrote numerous letters, the majority of which are cared for at ERO. 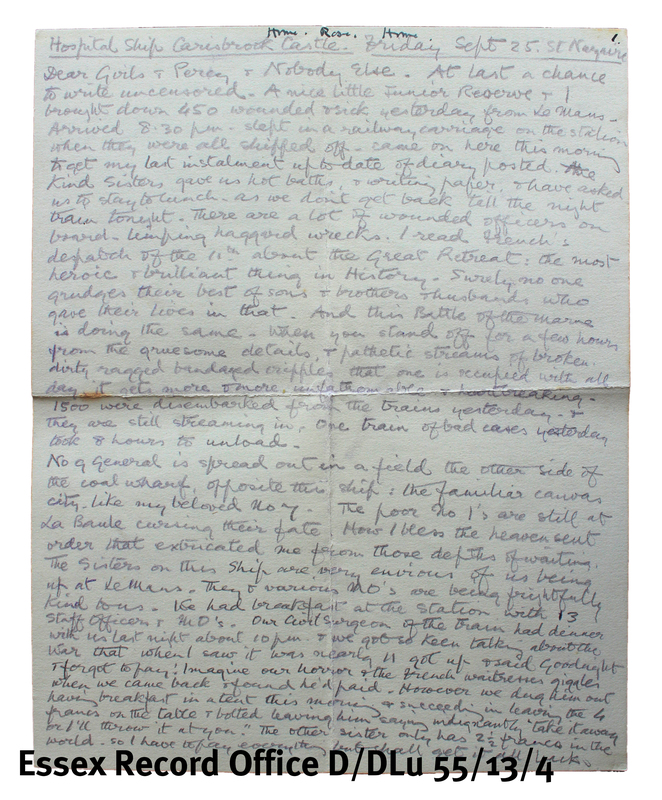 As we welcome warmer and longer spring days, Kate’s great niece Caroline Stevens has put together the following extracts from her letters written during wartime springs. Amidst the horrors of the Great War and the often insurmountable pressure of nursing the wounded soldiers Kate Luard found time to note not only the extremes of weather but the landscape, flora and fauna. This love of nature must have lifted her spirits during these stressful times. Wednesday, February 3rd, . Moved on last night, and woke up at Bailleul. Some badly wounded on the train. Beyond Rouen, the honeysuckle is in leaf, the catkins are out, and the woods are full of buds. What a difference it will make when spring comes. Friday, February 5th , Boulogne. Today has been a record day of brilliant sun, blue sky and warm air, and it has transformed the muddy, sloppy, dingy Boulogne of the last two months into something more like Cornwall. We went in the town in the morning and on the long stone pier in the afternoon. On the pier there were gulls, and a sunny sort of salt wind and big waves breaking, and a glorious view of the steep little town piled up in layers above the harbour, which is packed with shipping. Sunday, February 7th, Blendecque. We went for a splendid walk this morning uphill to a pine wood bordered by a moor with whins [gorse]. I’ve now got in my bunky hole on the train (it is not quite six feet square) a polypod fern, a plate of moss, a pot of white hyacinths, and also catkins, violets and mimosa! Wednesday, March 10th . We got to Étretat at about 3 p.m. yesterday after a two days and one night load. The sea was a thundery blue, and the cliffs lit up yellow by the sun, and with the grey shingle it made a glorious picture to take back to the train. It had been a heavy journey with badly wounded. We are now full of convalescents for Havre to go straight on the boat. There are crowds of primroses out on the banks. Our infant R.A.M.C. cook has just jumped off the train while it was going, grabbed a handful of primroses, and leapt on the train again some coaches back. He came back panting and rosy, and, said, “I’ve got something for you, Sister!” I got some Lent lilies in Rouen, and have some celandines growing in moss, so it looks like spring in my bunk. Thursday, March 11th . We are being rushed up again without being stopped at Rouen. The birds are singing like anything now, and all the buds are coming out, and the banks and woods are a mass of primroses. Thursday, March 18th . We had a heavenly ramble this morning, and found blue periwinkles and anemones in the wood, but no primroses. Lots of palm and gorse. Robins, willow-wrens, and yellow hammers were singing—much prettier music than guns, and it is good to get away from the sound of motors and trains and whistles. Tuesday, April 11th, Lillers. 1916. We had all the acute surgicals out in their beds in the sun to-day in the school yard, round the one precious flower-bed, where are wallflowers and pansies. We went for a walk after tea in the woods, found violets, cowslips and anemones. Saturday, March 17th, 1917…no sign of any buds out anywhere in these parts. I’ve got a plate of moss with a celandine plant in the middle, and a few sprouting twigs of honeysuckle that you generally find in January, and also a bluebell bulb in a jam tin. Saturday, April 21st . No rain for once, and the swamp drying up. Went for a walk and found periwinkles, paigles, anemones and a few violets – not a leaf to be seen anywhere. Monday, April 30th . We have had a whole week without snow or rain – lots of sun and blue sky. I went for a ramble after tea yesterday to a darling narrow wood with a stream. Two sets of shy, polite boys thrust their bunches of cowslips and daffodils into my hand. Also banks of small periwinkles like ours, and flowering palm; absolutely no leaves anywhere and it’s May Day to-morrow. Wednesday, May 9th . And what do you think we have been busy over this morning? 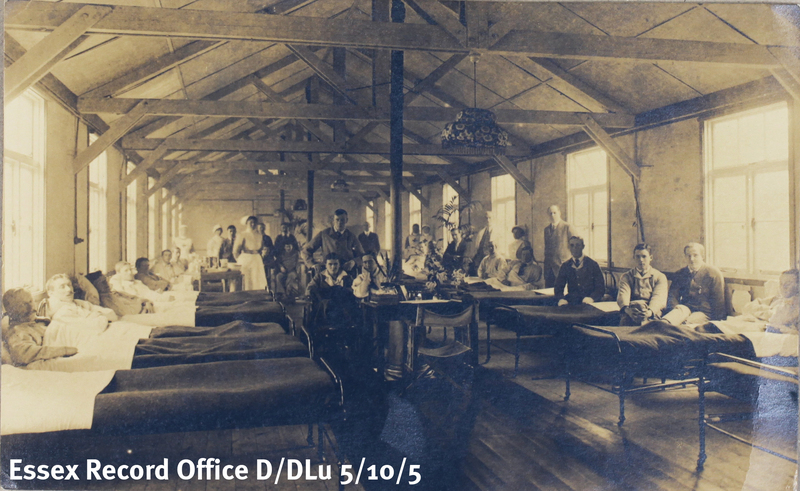 A large and festive Picnic in the woods, far removed from gas gangrene and amputations. We had an ambulance and two batmen to bring the tea in urns to my chosen spot – on the slope of the wood, above the babbling brook, literally carpeted with periwinkles, oxlips and anemones. We had a bowl of brilliant blue periwinkles in the middle of the table. Monday, May 14th . … it was Gommécourt over again but in newly sprung green this time. I think it made the hilly, curly orchards and wooded villages look sadder than ever, to see the blossom among the ruins, and the mangled woods struggling to put their green clothes on to their distorted spikes. Saturday, August 18th . We’ve had two dazzling days, but as there is not a blade of grass or a leaf in the Camp, only duckboards, trenches and tents, you can only feel it’s summer by the sky and air. Friday, April 12th , Nampes. Orders came for me on Wednesday to take over the C.C.S. in Nampes. Two other sisters came too, and we took the road by car after tea, arriving here at 11 p.m., after losing the way in the dark and attempting lanes deep in unfathomable sloughs of mud. It is an absolutely divine spot, on the side of a lovely wooded valley, south of Amiens. The village is on a winding road, with a heavenly view of hills and woods, which are carpeted with blue violets and periwinkles and cowslips, and starry with anemones. Birds are carolling and leaves are greening, and there is the sun and sky of summer. The blue of the French troops in the fields and roads adds to the dazzling picture, and inside the tents are rows of ‘multiples’ and abdominals, and heads and moribunds, and teams working all night in the Theatre, to the sound of frequent terrific bombardments. Sunday, June 16th . We emerge about 7.30 from our dug-outs, to a loud continuous chorus of larks, and also to the hum and buzz of whole squadrons of aeroplanes, keeping marvellous V formations against a dazzling blue and white of the sky. The hills are covered with waving corn, like watered silk in the wind, with deep crimson clover, and fields of huge oxeye daisies, like moving sheets. To-day there is no sound of guns and it is all Peace and loveliness. 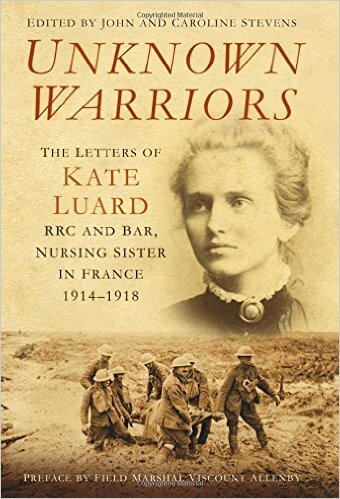 Many of Kate’s letters are published in Unknown Warriors: The Letters of Kate Luard, RRC and Bar, Nursing Sister in France 1914-1918, a copy of which is available in the ERO library. 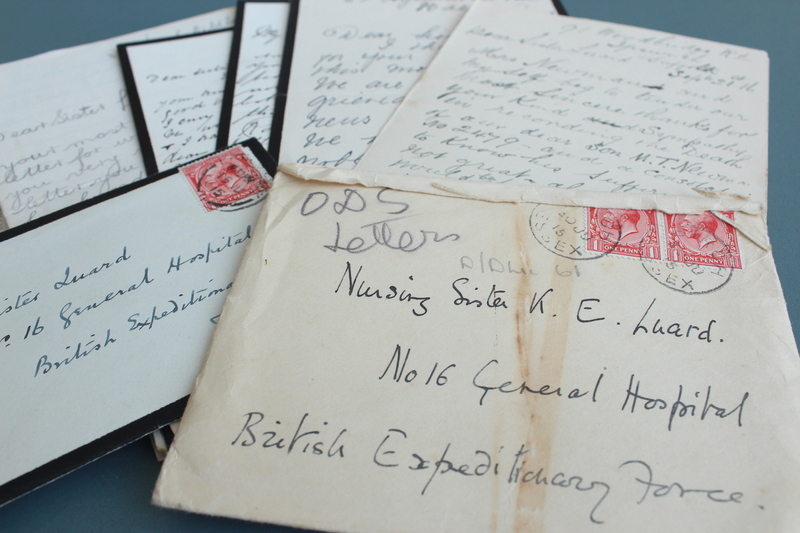 The original letters can be found in amongst the Luard collection, catalogued as D/DLu.